TaxProSites.com is ready to offer you the finest in personal service and reliability for your business. With over 16 years of experience in Web Hosting and Web Design, we are able to give you the latest products for your site such as WordPress, professional email accounts, Secure File Transfer, Facebook and Twitter linkage. We can help with all the confusing issues such as domain names, web mail, and much more. Please call us today at 570-885-0101 to speak with us about your business. All of our websites come complete with premium content provided by the certified seminar presenters. See an example of our monthly newsletters. Filled with links of interested for you, the tax professional. 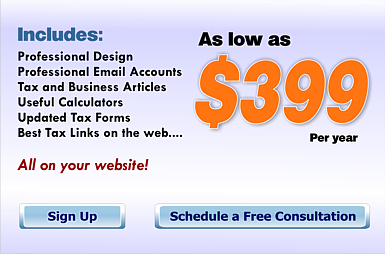 Many websites are excessively expensive and very difficult to use, especially for the tax professional. We feel we can provide our clients with a better solution at a more cost-effective rate. If you have a site that is rarely updated or is not worth its value to your business, you should consider the switch to Taxprosites.com. Taxprosites.com has the solution for you. We understand your needs and can show you how to make money with your site. Approximately 75% to 90% of your clients have full-time internet access, so websites are a great advertising tool. Where else can you place an ad that runs 24 hours a day, seven days a week for about $1.00 a day? We give you the best, most effective site to help you attract new clients, retain your existing client base, and do business more efficiently to increase your billable hours. You are extremely busy and can't be bothered be worrying about your website. Our dynamic content will guarantee that your website is updated regularly.